A huge economic crisis in Ecuador from 1998 to 2002 forced a great deal of workforce to emigrate. Aída Quinatoa arrived at Spain then, and so she spent two years living with some other people in an overcrowded room. She worked as a cleaner, and after some time she was determined to find a decent home to live in; she was told that if she bought a house, she would obtain a 120% profit from its value and she could also bring her family together. In order to obtain a mortgage, an immigrant had to have a cross guarantee signed. “In 2003 cross guarantees boomed, first, among relatives, then, among acquaintances, and finally, among absolute strangers”. A few things have changed since then; however, even today there is no possibility of a dation in payment for those mortgages with crossed guarantees. Aída Quinatoa needed to sign other migrants’ guarantees she did not even know in order to buy a house, so this policy might cause a domino effect if any of the crossed guarantors did not pay their deed. Aída found a lovely 861ft2 flat, she signed the mortgage, and put down an important sum of money as deposit. A bit later she was told that the owner had backed out, so she was shown another apartment which was much smaller, old, with failures in the plumbing system and walls, and at a lower value; instead of getting her money back. It did happen. The bank called without notice to repossess her home, the other people who had put up the cross guarantee stopped paying the mortgage deed. 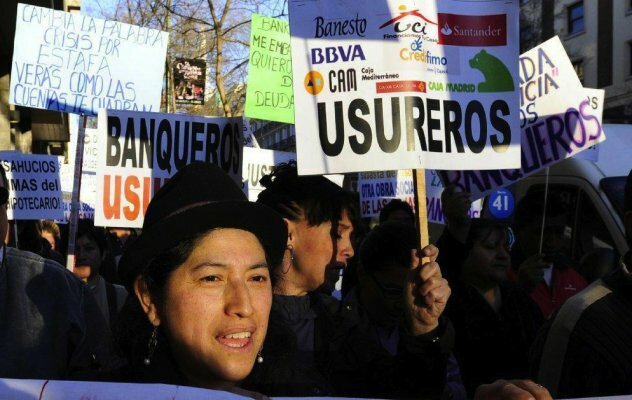 Aída went to the “Caja de Ahorros del Mediterráneo” (CAM) office, the bank she had the mortgage loan with. "They just rang and said, ’We are going after your house," she said. "But banks don’t like people protesting at their doors, so they accepted the keys to the other flat in return for cancelling the debt." "We are honourable people," said Quinatoa. "And we like to pay our debts. But this system is impossible and unfair." That was the beginning of a movement leaded by Aída Quinatoa: The Ecuadorean National Association in Spain. The association aims are integration, training, legal advice, Ecuadorean immigrants’ welcome and support in Madrid and promotion of Ecuadorean values and culture. In 2010 the association tried to stop Julio César Rodríguez’s eviction. He was an Ecuadorean man who, gathering a few savings and his sister’s salary, bought two properties encouraged by a bank, Caja Madrid. The bank pushed him to follow some legal procedures in order to end up committing an illegal act. In 2008 Julio César became unemployed, and after two years he received the eviction order. At that moment he tried to pay his debt by selling some lands in Ecuador, and a borrowing some money; but the debt kept increasing: the mortgage loan was 260,000 euros, the debt amount was 315,000 euros. In the end, he went to the bank to offer the keys of his flat in return for cancelling his debt, but the bank did not accept it. Aída confirms that it was the first difficult eviction they tried to stop, they did not success: there were few people involved, they summoned the media -press, radio and television- but no one showed up. Aída Quinatoa is also a spokeswoman for the Plataforma de Afectados por la Hipoteca or PAH (Platform of People affected by the Subprime Mortgage Crisis) in Madrid, a movement which was born in 2009 and got stronger with the citizens’ explosion of the 15M movement. On the 15th May 2011, a group of people gathered at the Plaza del Sol in Madrid, to demonstrate against the Law of Sustainable Economy, the demonstration was dissolved by the police. The following days, people started to camp in the main squares of the most important cities in Spain, something that exceeded the initial expectations of this protest, and would represent the social unrest against governmental politics. The 15M is a grassroot movement which developed afterwards in many heterogeneous ways, many other movements were born from it: the Marea Verde (Green Wave) -standing up for the quality of public education-, The Marea Blanca (White Wave) -in defence of NHS- or the Plataforma de Afectados por la Hipoteca -which claims for the right to a decent home-. * Dation in payment applied retroactively: claiming that once the foreclosure is made and the bank keeps the property, the handing of the keys is enough to pay off the mortgage debt for those living in their habitual residence and debtors acting in good faith. * Stopdesahucios (Stop evictions): actively stopping evictions because of economic reasons, which implies a demonstration and blocking the access to the police officers to the home where eviction is planned. Up to now, the PAH has stopped 725 evictions. * PAH charitable work: a campaign promoting the repossession of those uninhabited homes to recover their social aim. This means an immediate step forward to action, occupation is an effective claim because what is being demanded, it is being taken without the authorities’ permission. It is currently taken place in a good deal of cities in Spain, where actions are self-organized by groups of people, and they are indeed exceeding all expectations PAH had. Also, the occupation of social homes goes beyond the claim for a fair housing, since a new way of communitary living and alternative ways of living to neoliberalist organisation model are being proposed. The “corralas” were a housing model for humble families in the city centers from the 16th to the 19th centuries, these families shared common facilities and created links to be safer while community living. Capitalism made a new way of living universal, where individualism, voracious urban development in the 20th century destroyed almost all of these “corralas de vecinos”. The new idea of the “corrala” coined nowadays means a new concept to define social home occupation; so to say, it is not only an alternative to the serious housing problem, but also a proposal for new ways of living which undermines the basic approaches of capitalism, towards a life in common with self-managed resources. At the Corrala la Utopía (Utopia Corrala) in Seville, they call it the Spearmint Revolution: ring your neighbour’s door and ask for some spearmint, feel closer to the people around you, establish links and create support; in the end, take care and being taken care of because all of us are vulnerable. Twenty families without economic resources occupied a newly built building with no owner declared, a former propriety of an estate agent which went bankrupt, share the Corrala la Utopía. The Corrala, where thirty families are currently living, has been struggling with Ibercaja, the bank which now owns the building and which at first rejected the renting proposal the families offered, starting a forced eviction process. After many months struggling with the bank and administrations, Ibercaja withdrew the eviction claim and is now dealing with public administrations the conditions for a lease agreement. Last year, the PAH is more and more prominent in the mass media, thus creating a change in the perception the regular citizen has about the housing policies. Ada Colau, the general spokesperson, takes part in prime-time TV debates, writes a column in one of the main celebrity magazines -which gave Stopdesahucios stickers as gifts-, is interviewed in the major national newspapers and she even appeared in the Spanish Congress. On the RTVE, Spanish Public Radio and Television, an interview about the publication of her book “Vidas hipotecadas” (Mortgaged Lives) was cancelled arguing that there should be enough “information balance”, and that the PAH had already had enough coverage in other TV programmes of the channel. One of the biggest success of the PAH has been the visibility they have acquired throughout the mass media, and also changing the direction of public opinion about occupying social homes. However, What effective changes have been made in the Law due to that exposure to the media? How can they turn that change in the public opinion into actions against the Law that does not allow fair living conditions? Aída Quinatoa remarked in an interview: “The housing problem has become collectivized” so Why do immigrants still have so little media visibility in the demands against evictions, taking into account that they are one of the most exposed social groups due to their economic fragility? Neighbours’ Corrala, a way of living: La Utopía.